AirPlus can install a new tankless water heater in your home and you can start enjoying the savings of a highly-efficient water heater that can reduce your energy bill and water waste. We’ve partnered with Navien offering some of the best tankless water heaters in the industry! AirPlus offers a selection of Navien tankless water heaters. Schedule an appointment and our technician can discuss which model is right for your home. The chart shows you all of the stages of how a Navien tankless water heater provides endless hot water for your home. While tankless water heaters offer some awesome benefits, they’re not a good choice for everyone. First, your home needs to be equipped with access to natural gas or propane. Also, since combustion takes place in the heating process using gas there needs to be adequate ventilation for both combustion (fresh air flow) and exhaust. An AirPlus technician can quickly determine whether or not your home can accomodate a tankless hot water heater system. 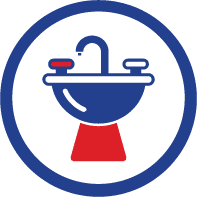 What’s the difference between a traditional and tankless hot water heater? A traditional water heater or “tank” water heater stores 30-50 gallons of hot water in a tank. That water is always ready to be used whenever someone showers, does the laundry or washes dishes. The water heater replenishes supply following use of the stored hot water in the tank. A tankless water heater uses a heat source (electric or gas) to warm up cool water on-demand whenever you need it rather than storing hot water in a tank. Lower initial cost – A traditional water heater installation can be half as much as a tankless water heater. Easy and inexpensive to replace – Less installation complications means that there’s less that can go wrong. Higher utility bill – They heat and reheat water at a pre-set temperature regardless of your water needs. This increases your utility bill—especially during the winter winter. Bigger and harder to place – They occupy more room and can’t be placed outside. Shorter life – Lasts 10-15 years. This means there’s more turnover and therefore you have to buy them twice as often as a tankless water heater. Doesn’t take up much space – They are small and can be installed in more places—even outside on a wall. Lives longer – can last more than 20 years. That’s 2X the life of a traditional hot water heater. Delivers hot water on demand – Provides two to three gallons of hot water per minute on demand. Higher initial cost – Costs $2800 to $4500 installed (depends on the model and who you get it from). New installs require retrofit – Replacing your traditional water heater with a tankless hot water heater can be complicated and involve increased installation costs. Which hot water heater is right for you? If your home can accommodate a tankless system, and you can afford a higher upfront cost, then you can save money on energy vs traditional water heating. If you want a low upfront cost and don’t mid a higher electric bill then replacing an old traditional tanked water heatrer might be the right choice for you. Tankless Water Heaters: Should I, or Shouldn’t I? AirPlus is family-owned and operated and offers some fantastic choices when it comes to hot water heaters. Our technicians are professionally trained to offer the best advice when selecting a hot water heater for your home. And when it some to hot water heater installation, AirPlus is second to none in Northern Virginia. Call AirPlus today to schedule and appointment for an estimate on your new home hot water heater!